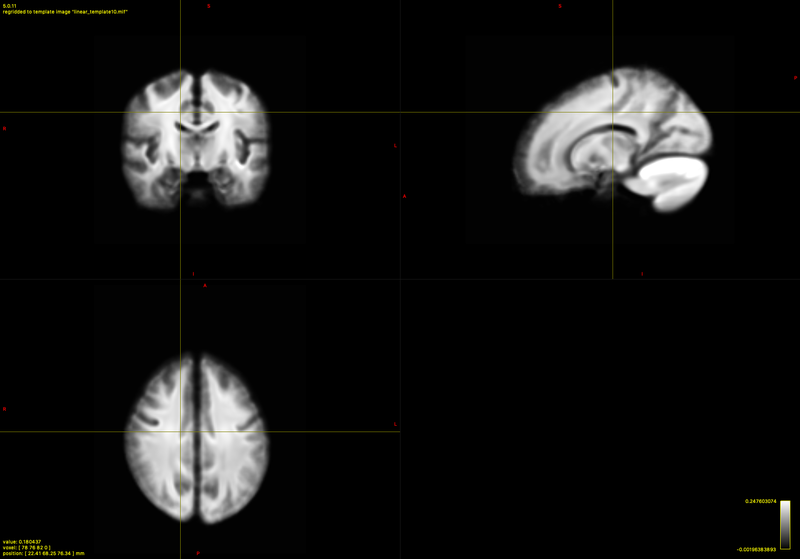 I want to do an analysis, comparing fixel-based, NODDI and DTI wholebrain statistic in a population of preterm 9-year old children. For this I use the msmt FBA recommended on the readthedocs. However, I notice 2 things in my fod/fixel templates. 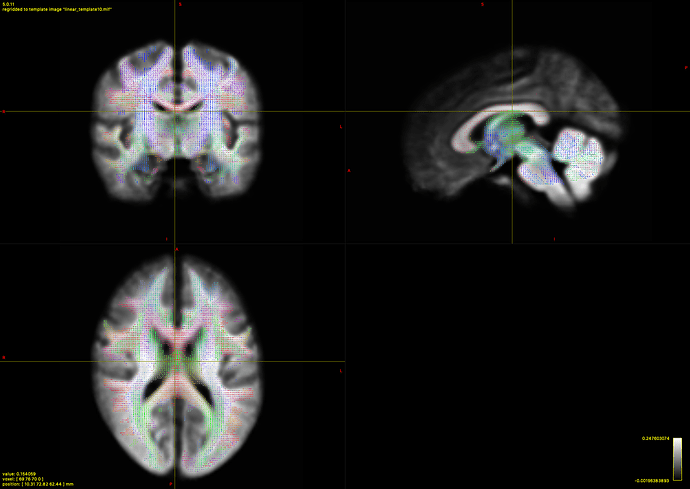 For starters, my Cerebellum is showing very bright in the fod template, is this normal? 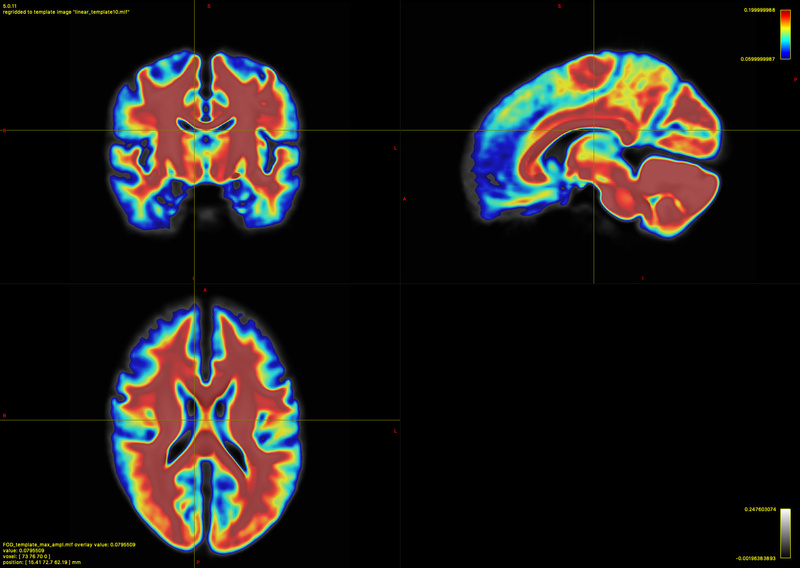 Secondly, if I use the recommended pipeline I get a very wide fixeltemplate, covering the whole cerebellum, some GM and making some false positive conection over the edge of the ventricles. Also leading to almost 80000 fixels in the mask (reducing statistical power). Plotting, the fmls_peak_values of the wmfod I think raising the threshold from 0.06 to 0.15. However this is not recommended in the pipeline. What would you suggest as a more proper way to restrict the mask? 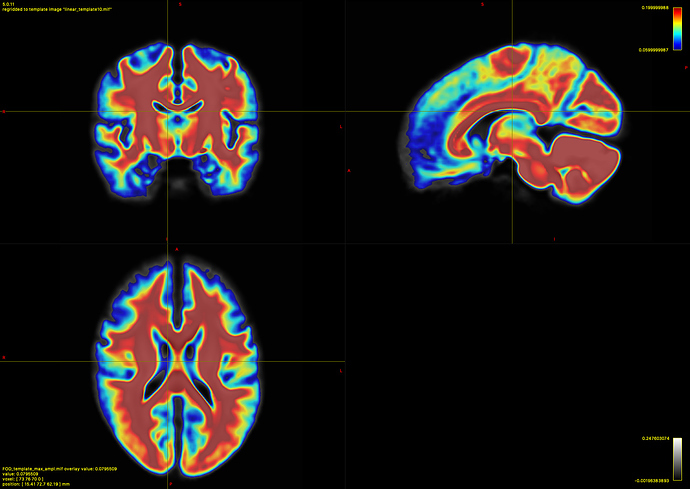 I would like to hold the benefit of the Dhollander msmt, and not getting my T1 images involved. This has been observed in various instances in individual subjects following B1 bias field correction (see eg. here; given it’s visible in your population template, I would suggest that the bias field correction may be going awry in a decent fraction of your subjects, and it’s worth going back for a look. Also leading to almost 80000 fixels in the mask (reducing statistical power). What would you suggest as a more proper way to restrict the mask? Personally I’m a strong advocate of restricting statistical analysis to those fixels that are traversed by an adequate number of streamlines in the template-based whole-brain tractogram (more to come on this in the future). Bear in mind that you can provide a fixel mask to fixelcfestats, and it’s the number of fixels in that mask that affect statistical power / RAM usage, not the total number of fixels in the template. So you can be more “liberal” with the template voxel masking / fixel segmentation, and then subsequently use multiple sources of information (eg. fixel streamline count, fixel FOD peak amplitude, fixel FD, voxel AFDtotal, …) to derive a fixel processing mask that you deem appropriate. Is the spatial resolution of your template the same as suggested in the documentation? That strongly influences the number of fixels also.